Fellow Geelong fans, we have an opportunity to be part of something special this weekend. No, it’s not celebrating the boys winning four straight and beating a flag favourite to keep our flaky season alive. Although we will take that, happily. Saturday night’s clash at Simmonds Stadium presents a situation that transcends football. Adam Goodes returns to the field, meeting a sea of navy blue and white supporters. How will we, with the nation watching on, receive him? The match itself seems secondary to this very question. The lead up will be dominated by speculation not of tactics, players or odds, but of whether faceless spectators hiding behind the fence will continue the jeering that has divided the country. The match result might influence the ladder, but the crowd behavior will leave a permanent mark. What a great shame for our football club and for our nation if a man whose public harassment, grown from the seeds of racism, would continue despite the events of the past fortnight. Whether one believes the taunts to be racist or not, this issue is now a question of public bullying. There’s a target who has made his distress abundantly clear, and now the onus is on individuals to collectively recognise that enough is enough. Fellow Cats fans, the spotlight is on us. CEO Brian Cook has been on the front foot. “What is going on is not the Geelong way – treating people unfairly and being abusive – so we want to do something about it to make a stand against those elements,” Cook said. Coach Chris Scott has echoed Cook’s sentiment, but with a pointed message for anyone seeking to continue this regrettable chapter in football history. “The reality is now, whether we like it or not, booing indigenous players and specifically Adam Goodes has a racist overtone so on that basis it should stop,” Scott said. To be blunt, if you boo Goodes this weekend, you’re siding with bigots. I have faith that the Geelong Football Club, the club I love, will provide a timely example of sensible and civil crowd behavior. Yet rhetoric from club leaders won’t suffice. Ultimately, it’s up to us as fans, here given a rare opportunity to decide a pivotal outcome in our great game. I’d go so far as to say that if Goodes happens to kick a goal this weekend, stand and applaud. Not for the outcome of the match, but to demonstrate that we can be better. We understand that sport has the power to unite, not divide, and we will cheer for a human, not a player. It would be some moment. Moments are important in sport. Collingwood supporters at Victoria Park found themselves on the wrong side of history in 1993, heaping vitriol on Saint star Nicky Winmar before he proudly showed his colours. Last week, Sydney and Adelaide fans stood in unison in a show of support for Goodes. History will remember. So the question remains: what history will be written on Saturday night? 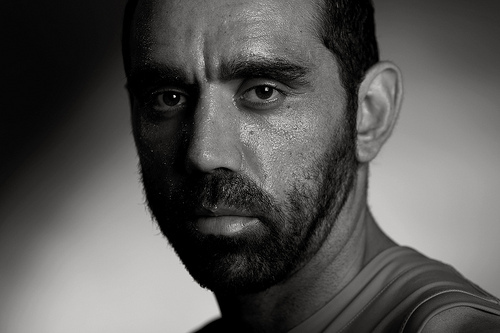 During the past few days I’ve heard commentators express their confidence that Geelong, a proud club and a proud city, will be the ideal place for Adam Goodes to begin his reengagement with the game. I hope they are right. “Grown from the seeds of racism” …..What? Great in theory, but what if he hits Joel Selwood behind play? What if he starts staging for free kicks? Should we treat him any differently to any other player who does those things???? I think the whole thing has gotten out of hand, but if he does hit our players and we don’t boo then we are as bad as the “racists” if you ask me. Go grab another tissue Adam Goodes…..you are a serial sook! The Cats and Bloods are of a similar culture. We the supporters from South Melbourne are confident Geelong people will be fair minded as usual.